RADAR SRL, Vanatoare si pescuit - haine, pepper pistol, pistol holsters, pe EUROPAGES. Manufacture of holsters, cartridge belts, gun covers, revolver cases, army belts, jackets, law enforcement agent pouches, sports bags, travel bags, army accessories. Cordura accessories, arms bags, pepper guns, repellent sprays. 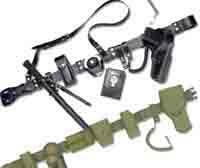 Accessories in cordura, weapons bags, tear gas guns, repellent sprays. Bum bags and weapons bags.